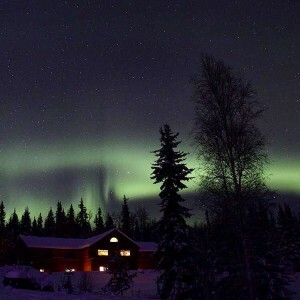 Best Fairbanks Aurora Viewing Spots + Exciting New Press! 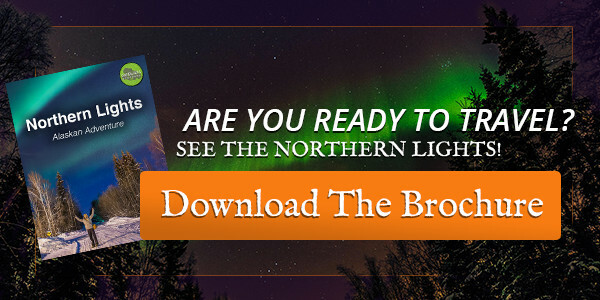 Best Fairbanks Aurora Viewing Spots + Exciting New Press! What Makes a Good Aurora Viewing Spot? When choosing a location for Aurora viewing, you want to keep a few things in mind to ensure that you are getting the best of the displays and staying comfortable in this cold winter environment. Below we will list some important qualities and 3 of our favorite spots. The best places for Aurora viewing are far from the lights of any city or nearby businesses. 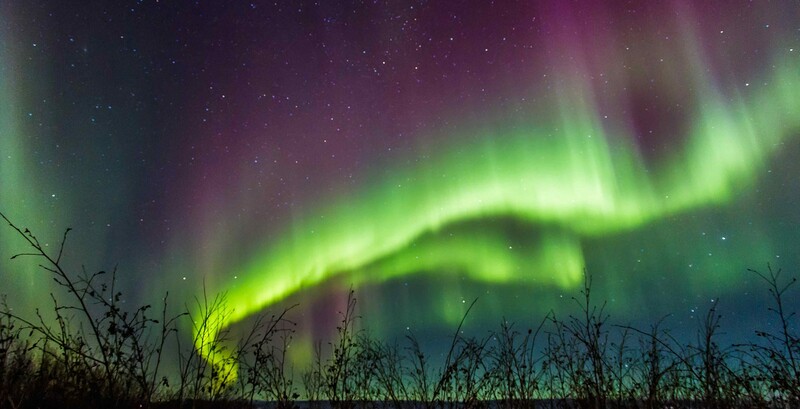 The darker the area, the more you will be able to see the Northern Lights colorful displays. 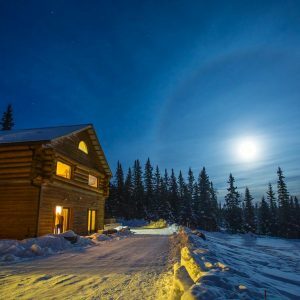 In Fairbanks there are a number of great lodges outside the city where you can view right on the property. You will want to be at least 15 or 20 miles outside of downtown Fairbanks. Wherever you choose to view from, make sure you stay on well maintained roads because driving in the Alaskan winter is hazardous and you don’t want to get stuck. It is important to consider your field of vision when planning Aurora viewing, because you never know in what part of the sky it is going to appear. Sometimes it is only in one part, and other times it stretches across the entire sky. Viewing from high elevation is one way to guarantee you will see the Northern Lights wherever they appear, and it makes for incredible photographs. If you want to stay out for a long time watching and photographing the Aurora, you will need somewhere warm to retreat in between displays. Many lodges, including our own, have heated tents or “yurts” where guests can hang out and escape the cold for a bit. This also helps to keep your technology and photography gear from freezing up. There is nothing quite like Aurora viewing from the comfort of a steaming geothermal hot spring. 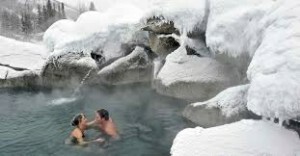 Chena’s outdoor rock pool is filled with healing mineral waters that stay at an average of 106 degrees year round, but it is surrounded by snow. Sometimes the hair on your head will frost over, but your body stays nice and warm. The springs are located 60 miles outside of Fairbanks so there is very low light pollution. From the pool you have a great view of the Northern half of the sky, where most Aurora activity originates from. They also have an indoor viewing area nearby, as well as an airfield where you can get great photos of the Aurora with small planes in the foreground. This lodge is where we like to stay with guests. Located on top of a hill, you can view the lights from right outside your room, but the best spot for Aurora viewing and photography is just a few meters down the hill. There are plenty of chairs available, as well as a heated yurt with couches and a wood stove where you can escape the cold in between displays. The best part is that when staying there with Gondwana, our guides provide wake up calls when the Aurora appears so you don’t have to stay up all night watching the skies. Once you are up our guides are available to assist you with photography and bring you hot tea or cocoa while you enjoy the light show. These two spots are far outside of town so there is no light pollution, and you can enjoy 360 degree views of the Aurora so you don’t miss a thing! Ester Dome is about 15 miles outside of town, a 25 minute drive. Make sure you have good snow tires if you are going to drive up there in winter! It stands at over 2,300 feet and is home to hiking trails and plenty of wildlife. Murphy Dome is even higher – at over 2,800 feet it is the highest point close to Fairbanks. Most of it is low vegetation which makes for easy off trail exploration while viewing. The last 200 feet of elevation are actually an Alpine environment, so bring appropriate gear if heading to the summit! La Oferta Features our Northern Lights Tour! We are proud to have been listed by La Oferta in their article “Off Beat Trips Await Adventurous Tourists”. We are listed alongside other off-the-beaten-path trips in Russia, Ethiopia and Wyoming. Author Bob Schulman notes some of our exciting activities like dogsledding, hiking with reindeer and soaking in hot springs. He also recognizes the our unique features like Aurora wake-up calls and professional photography assistance while you watch the Northern Lights. We are so grateful to have been featured on this list of amazing trips!